I know it's been awhile since I've posted here and I apologize to those of you following me. That pesky day job just got really busy, but I'm back! As we're getting into warmer weather I thought it'd be appropriate to offer up a refreshing wine served chilled to go with your next fruit & cheese plater, salad or grilled fish dish. 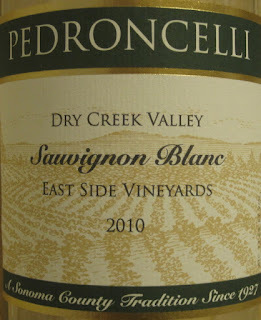 Sauvignon Blanc is one of those wines which are nice to start out your evening happy hour or even pre-dinner beverages. This was a wine I found while visiting the great folks at Pedroncelli last fall. The aromas filled the glass with apples, pear, citrus and a hint of flint. The flavors, as many Sav. Blanc wines have were of ripe grapefruit along with melon and pear nectar. It drank very smooth with the citrus not being too overpowering. It was also nice to not have have a strong grassy and asparagus hint in this wine which is so common amongst this varietal. I started this bottle before dinner and decided to stick with it through my main course. It paired great with a wood grilled Amberjack fish which I caught myself. I like to use a medium flavored spice rub on this fish and the wine did a great job in complimenting it.